If not a month seems to go by without a new Julia Fischer release then the same can be said of historical re-releases by her fellow countryman Gerhard Taschner. Things seem actually to have heated up in this respect and this is the latest in a mini-avalanche of diverse material from the 1940s and 1950s to have entered the public domain. Some of course has been recycled. 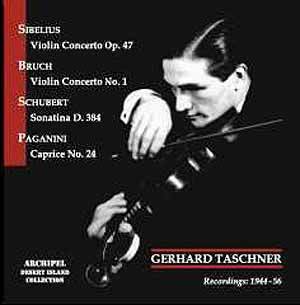 The Abendroth Bruch has already appeared on Archiphon where it was coupled with the Khachaturian Concerto with Rother (1947) and the wartime inscription of Sarasate’s Zigeunerweisen with Michael Raucheisen. This Sibelius, however, has been less widely issued and I’ve not heard it before its appearance in this Archipel release. The white-heat Gold Standard for German violinists in this work was set by Kulenkampff, whose live broadcast with Furtwängler has been widely re-issued. That was a performance of searing intensity. Over a decade later Taschner turned to it – he shared something of the Hanseatic Kulenkampff’s predilection for the Slavic. But Taschner’s Sibelius couldn’t be more different from that of his august predecessor. It’s lightly bowed and curiously undemonstrative despite the quick slides. He reserves tensile power and instead adopts a broadly aristocratic, rather aloof profile. The first movement cadential passages are rather unconvincingly phrased and the orchestra meanwhile sounds rather prosaic and uncommitted. Taschner brings some fanciful moments to the finale but as a whole this is a rather lightweight reading. The Bruch was a concerto staple for him. A later Müller-Kray broadcast has also survived and can now be found on MDG (see review). Abendroth’s reading however is broader and more gravely sculpted, though not entirely uncontaminated by tape problems. There’s residual tape noise at points and a strange sense that once or twice the solo line has been spliced in – though clearly it hasn’t. Abendroth is his tumultuous, broodingly romantic self but as ever I find Taschner ill-equipped tonally to do justice to works of this kind. His Schubert is a pleasant discovery, neatly and attractively played. His adroit sense of rhythm comes in handy here and his partnership with Hans Altmann is also preserved in the shape of the Paganini Caprice – that one – with its anachronistic piano accompaniment. Despite the fact that he’s never really convinced me as a soloist I’m sure Taschner’s admirers, of whom there are many, will enjoy this romantic collection.